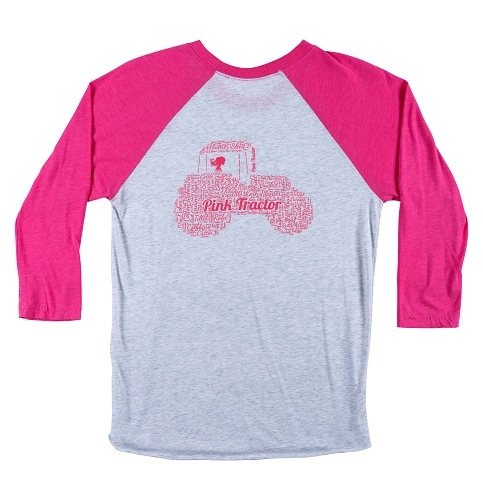 Our newest t-shirt is a whimsical design depicting the Pink Tractor logo as word art on the back of this tri-blend jersey. When wearing this tee, you'll show the world how women in agriculture are both Woman strong. and Farm smart. The word art just scratches the surface of livestock, crops and equipment used by woman in ag. 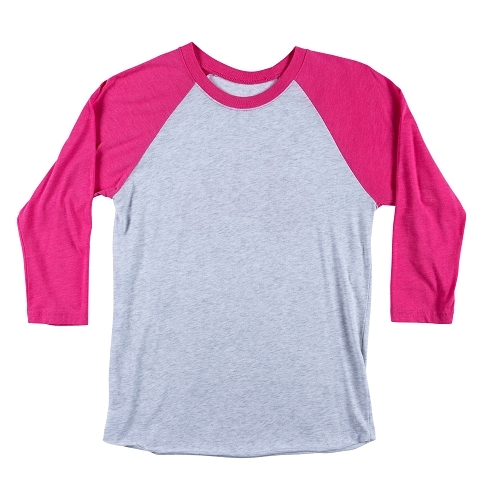 The raglan tee features pink 3/4 sleeves that extend in one piece fully to the crew neck collar, leaving a diagonal seam from underarm to collarbone. The rest of the garment is a heather white. Made of 50% polyester and 25% combed ring-spun cotton and 25% rayon. Super soft, comfy and perfect for any woman in ag! These shirts don't shrink and run a little large. You may want to go down a size if you like a tighter fit. NOTE: The front of this tee is blank.